Bitcoin is on a meteoric rise. The cryptocurrency rose more than 13x in 2017 and has risen exponentially since first breaking onto the scene early this decade. 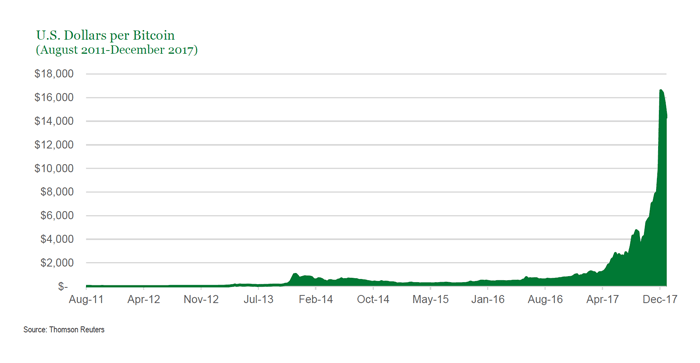 While bitcoin’s price has soared at an astounding, orders-of-magnitude scale, the road has not always been smooth. From the day of the first transaction in 2010, when an early bitcoin user famously purchased two pizzas with 10,000 bitcoins, its price has risen from fractions of a penny to over $14,000. In the process, the digital currency has also suffered from three separate declines of over 80%. Bitcoin is a payment network enabled by a newly created digital currency. Unlike traditional payment networks, Bitcoin is decentralized and without the backing of a company, governmental body, or physical commodity. Instead, the Bitcoin network is a person-to-person network. The network maintains and verifies balances on a shared transaction ledger called blockchain. Blockchain is one of the key technologies with real-world use cases, though the extent of its utility and adoption is an open question. In traditional payment networks, transaction verification is handled by a central trusted third party (Visa, MasterCard, etc.). Bitcoin is decentralized, so transaction verification is essentially crowdsourced to people known as “miners” who are rewarded for their efforts with newly minted Bitcoins. Bitcoins are also a finite commodity, limited to a fixed supply of 21 million. Until the total supply is in circulation, bitcoins can be “mined,” or received, by verifying bitcoin transactions. Though bitcoin miners are “finding” new bitcoins each day, mining each new coin is increasingly expensive and difficult. Aside from mining, bitcoins can also be purchased with real currency on internet exchanges. Once acquired, owners must hold a digital encryption key that can be stored on a computer drive, internet wallet application, or even printed paper—hopefully on multiple copies or in a safe! 2. How can I use it? Bitcoins can be used to purchase various goods, though options are currently limited. As the network attempts to become more widely accepted, it is still suffering from a few challenges. First, a bitcoin transaction can take hours to process as the decentralized network must verify each transaction several times. Transferring bitcoins is also quite expensive. The average fee at a Bitcoin ATM can be very high, several percentage points of each transaction, and there is an additional fee charged by the network. Bitcoin’s anonymous capabilities has also caught the attention of regulators due to its ease of use in illicit activities, challenging bitcoin’s ability to gain government support. Finally, users need to take particular care of the digital coins. There is no government insurance protecting your cryptocurrency should your digital copies become destroyed or hacked, and if you choose to store your bitcoins offline and lose them, they would be lost forever. 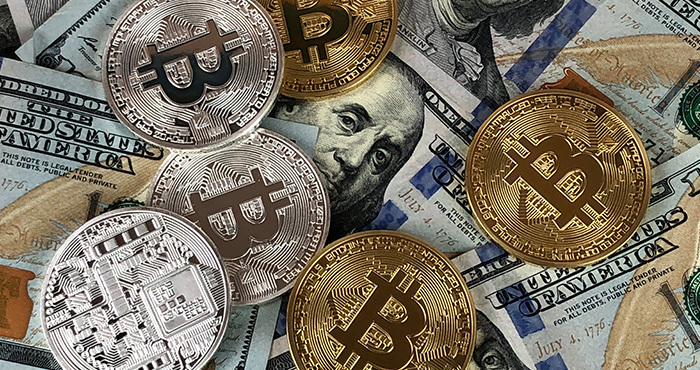 Though there are some real-world applications for bitcoin and its underlying technology, we consider the digital currency a purely speculative purchase as opposed to an investment. Instead, we are analyzing the investment implications to target potential winners and losers. For example, the semiconductor industry provides the computer chips used by cryptocurrency miners who demand significant computational power. The semiconductors are benefitting from heavy mining intensity, although currently, many of the beneficiaries in the space are either overvalued or lack fundamental support in our view. Additionally, even for the semiconductor companies that are exposed to cryptocurrency mining, none are “pure plays,” and cryptocurrencies represent a small percentage of revenue for even the most exposed companies. Banks are also in the early stages of incorporating blockchain technology. Blockchain technologies could improve efficiencies as an electronic contract verification tool and/or as a facilitator of interbank transactions. Finally, there are even some applications for crowdfunding startup enterprises by a process known as an initial coin offering. This new funding mechanism could disrupt the venture capital space. To be sure, we believe it is premature to draw any hard conclusions about the future of cryptocurrencies, blockchain technologies, or their applications, and we will continue to monitor the space to identify the investment implications as they arise. To receive timely updates on what’s trending in the markets and how it impacts investors, subscribe to our Markets & Economy Blog.